Image Index Two aspects of glories seen during the same flight by Nik Szymanek (astrophotography site book). 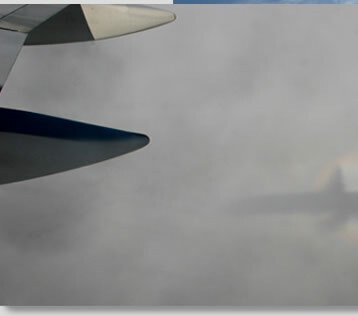 When the aircraft is a short distance above the clouds its shadow looms large and the glory can be seen to surround the point where you are seated. When the clouds are far below the aircraft the shadow is hardly visible. 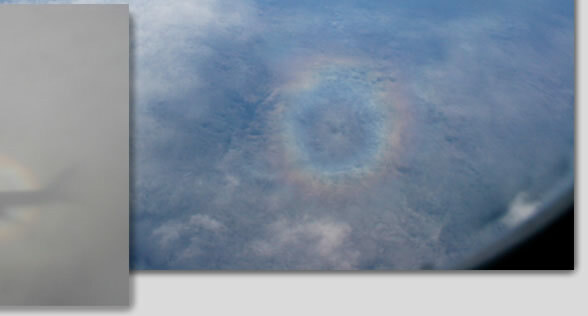 However, the glory's angular size depends only on the diameters of the cloud droplets, the distance of the cloud has no effect on how large it looks. Images ©Nik Szymanek, shown with permission.